Brian Moench is a contributor to Writers on the Range, the opinion service of High Country News. He is a medical doctor and board president of Utah Physicians for a Healthy Environment. Utah is world-famous for the breathtakingly beautiful landscapes of its national parks — places like Arches, Zion and Canyonlands. But our unique vistas aren’t the only things that can take your breath away: Air pollution is a major Utah problem. During the winter inversion season, Salt Lake City can suffer the worst air quality of all of our nation’s major cities; when the air pollution is that serious, it’s comparable to active firsthand smoking. The nearby Kennecott copper mine is a big reason why, as it’s far and away Utah’s largest source of toxic pollution. 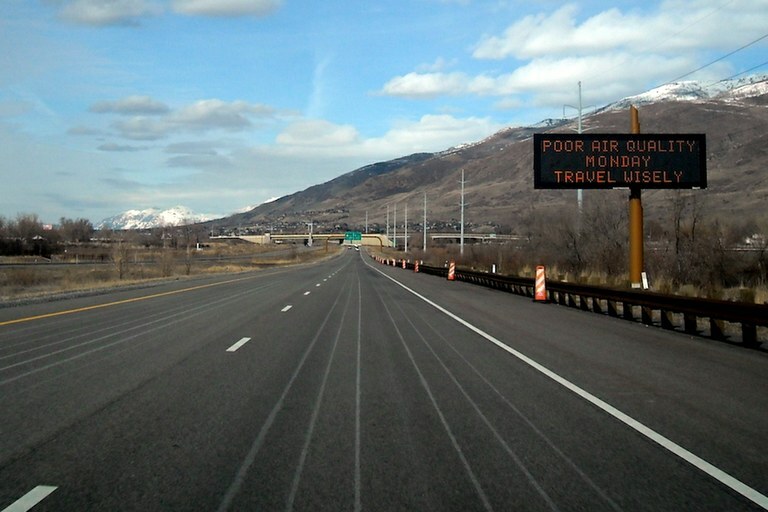 A road sign near Salt Lake City, Utah, warns drivers of poor air quality conditions. For several years, Kennecott, a subsidiary of the multinational mining giant Rio Tinto, has hurt the health of Utah’s families. It has done so by violating the mine’s federal production limits, which were put in place in 1994 to curb particulate matter pollution and protect public health. The mine has also severely contaminated nearby groundwater and the Great Salt Lake — to the point where water treatment will be required indefinitely. For years, groups like Utah Physicians for a Healthy Environment have pushed for better oversight of mining operations. Now this group is worried about the industry’s plans to make mining in the state even easier. Federal officials are considering a proposal to add mining to the list of sectors covered by federal legislation that grants funds and speeds up infrastructure projects. The law is called Fixing America’s Surface Transportation, aka FAST-41, passed in 2015. How can mines qualify — the way roads and bridges certainly do — as community “infrastructure?” Mines produce vast quantities of waste, much of it hazardous waste that must be managed forever. Even with modern technology, water pollution, enormous waste-rock piles, heavy-metal-laden dust and toxic spills are the norm. Worse, the decision on whether to allow mining projects to be fast-tracked is being made behind closed doors, without any involvement from the citizens who will be most affected by it. But you can bet those closed doors have been open to mining lobbyists. Some might say that we should trust the mining industry to do the right thing. They need to bear in mind that the chairman of the National Mining Association board, Phillips S. Baker Jr., was recently branded a “bad actor” by the state of Montana for his former company’s failure to clean up old mine messes. And Montana is hardly a hotbed of environmental extremism. When special interests seek special favors from government, they often disguise it with euphemisms, calling it “reform.” But to the mining industry, “reform” simply means elbowing the public out of the way. We need more, not less, oversight to reduce the damage and public costs imposed by mining. We are all saddled with the General Mining Law, passed in 1872, which still governs today’s modern mining industry. The law — a relic from the days of Manifest Destiny — leaves communities exposed to harmful pollution in perpetuity, and makes taxpayers liable for cleanup costs. Bringing this outdated law into the 21st century should be a top priority. Proposals offered by New Mexico Democratic Sen. Tom Udall and Arizona Democratic Rep. Raúl Grijalva are a step in the right direction. Every year, in a Toxic Release Inventory, states and counties are ranked for their overall environmental contamination by the Environmental Protection Agency. Invariably, the winners of those dubious honors are home to places like Kennecott that boast large mining operations. In fact, it is because of Kennecott that Utah always ranks in the top three most toxic states. Heavy metals found in mine waste are linked to a long list of serious, chronic disorders, like brain damage, heart disease, cancer and premature death. The medical research is definitive in saying that there is no safe level of exposure to air pollution: All of it causes harm, even at levels far below the EPA’s standards. There is no safe level of exposure to the heavy metals in mining dust. In addition, most heavy metals do not degrade and cannot be destroyed. The longer a mining operation continues, the more these toxic substances accumulate in our air, water and soil — and our exposure steadily increases. Therefore, it requires the utmost care to ensure that risks are minimized and that the public is fully involved in how decisions on permits are reached. I trust that the Federal Permitting Improvement Steering Council, the body composed of representatives from the numerous federal agencies that will rule on this proposal, will perform due diligence. Public health must not be sacrificed for the benefit of the mining industry. China v. Utah: Whose air is worse?